Click above image for larger printable map.The Portland Bureau of Transportation has released its plan for a new bike way in Northeast Portland – a project that generated controversy last summer and fall about the agency’s outreach efforts, as well the possibility of altering Northeast 7th Avenue to create a neighborhood greenway. 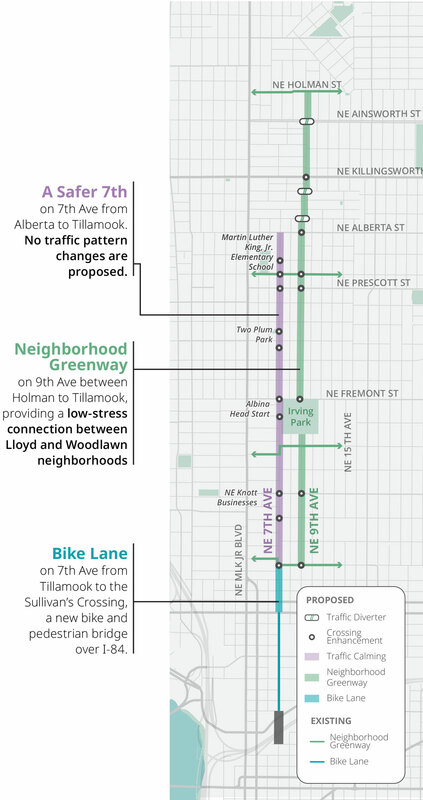 The resulting plan is what PBOT spokesperson Hannah Schafer describes as a “twofer” – a hybrid route using both Northeast 7th Avenue and Northeast 9th Avenue to connect the Woodlawn Neighborhood to the Lloyd District. Northeast 9th Avenue will become a neighborhood greenway – defined by PBOT planner Nick Falbo as a “safe, calm street for walking and biking” with shared lane markings (sometimes called “sharrows”) on the street, extra marking at intersections to aid bike and pedestrian intersections and traffic diverters at high-traffic intersections. And Northeast 7th – previously considered for development as a greenway – will undergo a series of improvements to make the route safer: safer crossings at intersections near schools and areas with high levels of pedestrian activity and enhanced crossing markers at some intersections. The agency will also add speed bumps to slow traffic at certain locations, including Albina Head Start and King Elementary School. Falbo said PBOT plans to remove some of the roundabouts on 7th in the Irvington neighborhood – which were intended to slow traffic but create pinch points instead -- and will add bike lanes on some sections of the street, including a lane connecting Tillamook to Weidler. Also under consideration: bike lane markers on sections of the street where cyclists are climbing a hill and therefore moving more slowly, so they can safely move out of the way of cars as they ride. Eventually, the route will extend to southeast Portland via the Sullivan’s Crossing Bridge, a bridge that will cross Sullivan’s Gulch and be open to bicycles, pedestrians and emergency vehicles. The new plan, PBOT officials said, is largely the result of community feedback, particularly from the Black community. Falbo said the initial results of outreach efforts – including a February 2018 open house at King Elementary School and an online open house early last year – showed support for a Northeast 7th Avenue greenway. “The outreach process and the work that Nick and the planning team has done on this has really led to a great sort of resolution and, essentially, a bigger win than we would have ever gotten from choosing one street over the other. And it’s really the result of all the wonderful feedback that we’ve gotten from the Black community, from neighborhood associations – from everyone. Without having that participation, I don’t think this project would have been as well thought out without that feedback,” Schafer said. Falbo noted that Northeast 7th sees an unusually high level of bike traffic, probably due to its proximity to Martin Luther King Jr. Blvd., and that’s why PBOT is still pursuing changes on the street that would better accommodate cycling. But, he said, Northeast 9th Avenue better meets the criteria for a neighborhood greenway: it’s parallel to a major thoroughfare, provides access to a lot of amenities and sees a relatively low volume of traffic (1000 or fewer cars per day). But as The Skanner reported last August, outreach efforts were slow in reaching households of color, and some members of the Black community were critical of making Northeast 7th a neighborhood greenway due to the high volume of car traffic on the street. The agency subsequently convened focus groups with institutions like SEI – which draws Black families from around the metropolitan area to Northeast Portland for services – as well as the SOUL District Business Alliance, the Portland Community Reinvestment Initiative and individual stakeholders. 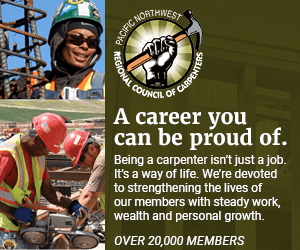 The transportation advocacy group The Street Trust, in a statement submitted to The Skanner, also expressed support for the Northeast 9th Avenue greenway, and praised PBOT for reaching out to communities of color. Falbo said PBOT is planning on having an open house in the future to unveil final plans and make the public aware of the coming changes. To stay updated on the Lloyd to Woodlawn project, visit PBOT's page to subscribe to email updates.